I have a video of my now 18 year old niece when she was barely 3 years old singing, "Part of your World," along with Ariel from (of course you know) The Little Mermaid. It is as priceless as it sounds. 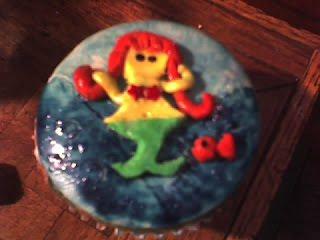 When a co-worker commissioned me to make her some whimsical cupcakes, with the help of that long lost 3 year old, I knew just what to make; because we all know what Ariel really wanted was some cake. All in all, the creation process went fairly smoothly which I was more than delighted about. My biggest difficulty was that although simple, without my artist husband I'm not sure I would have gotten the shapely figure of Ariel quite right, in fact towards the last cupcake she started looking a bit stiff. They taste as good as they look; if you don't trust me order some. (I'll be saying this a lot until I get a camera) blasted that I don't have a camera! I went with Wilton star Sprinkles for the bikini top, and once the design was complete used a pastry brush dipped in water with dissolved white sugar to create the wet ocean, while the eyes were added by simply dipping a toothpick in food coloring. Looks yummy! You are so talented. LOVE THE BLOG, the wall paper is fabulous. How can I get some for myself? FYI - Whitney is 19! Can you believe it? I got my wall paper at http://www.thecutestblogontheblock.com/backgrounds.php?cat=39! This is darling and sounds yummy! you are sooooooo awesome!